A statue of India's first and longest-serving prime minister, Jawaharlal Nehru, sits outside India House at Aldwych. Nehru served as Prime Minister from 1947 until 1964. He is still celebrated as one of the fathers of modern India and his legacy is a strong presence in Indian politics to this day. Indeed, the wife of his grandson, Sonia Gandhi, is still a force in the Indian Congress party, serving as Chairperson of the United Progressive Alliance in the Lok Sabha and the leader of the Congress Parliamentary Party, and his great-grandson Rahul Gandhi is the future of the dynasty. Last year, the statue was beheaded by vandals and some associated it with Tamil protests, claiming Tamil protesters were upset with India's support to the Sri Lankan government against the LTTE. Your author has no comment on this. The damage took place in April last year and the remains were apparently found wrapped in a white sheet. 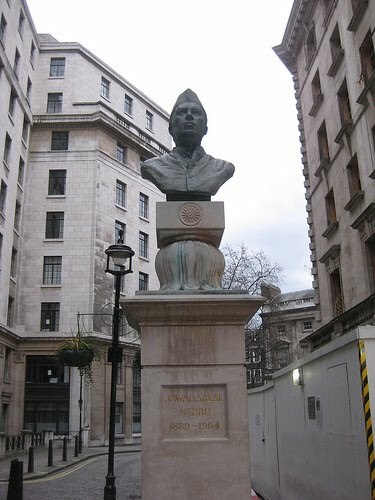 Today, however, the statue has been fully restored and sits on India Place beside India House.